The 200kW double-turbine floating platform, called Wind2Power and under development since 2009, is a 1:6 scale model of a 10-12MW full-scale design. With two 100kW nacelles mounted, it sits port-side at the Canary Islands' Astican dockyard, Gran Canaria. 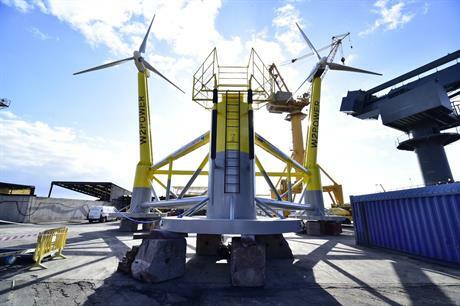 The W2Power platform will be towed 2.5km out to sea from Punta de la Garita, potentially "in the first days of May," EnerOcean founder and W2Power designer Pedro Mayorga told Windpower Monthly at the unveiling ceremony. The site is within the Canary regional government's Plocan area, where it is providing infrastructure and technical and administrative support for an initial 15MW of offshore wind, with a view to 300MW by 2025 — mostly floating. Mayorga believes W2Power's design features could reduce the levelised cost of energy (LCoE) to around €80MWh for a 50MW array at full-scale and "at the best wind sites". He aims at a pre-commercial array of three floaters, totalling 30-36MW by 2022 and is looking for a major turbine OEM to join the project. An innovative feature of the platform is the elimination of the nacelle yaw, an almost universally applied mechanism for commercial scale wind power that rotates the nacelle forcing the rotor to face the wind. W2Power comprises a triangular floating steel structure, mounted onshore and is towed to its sea moorings, eliminating jack-up crane costs. The forward-most point of the triangle is a swivel axis, with the two remaining points housing the turbine tower and nacelle. With the nacelle's yaw system immobilised, the entire floating platform swivels on the front axis to face the wind — the same principle as a weather vane. "Yaw elimination reduces moving parts and maintenance costs greatly," says Alex Fairtlough of aerospace engineering consultants ISATI, which joined the W2Power project consortium last year. The design remains the sole property of EnerOcean. But apart from ISATI, partners include Spanish control systems giant Ingeteam, which carried out trials on the nacelle and immobilised the yaw system. Other partners are UK's Tension Technology International (TTI) and Spanish engineers Ghenova. Smaller scale prototypes have been tested at eight wave tanks across four EU countries. The project is located 40km from the Elican 5MW prototype, the first wind turbine in Spanish waters installed in mid-March 2019.